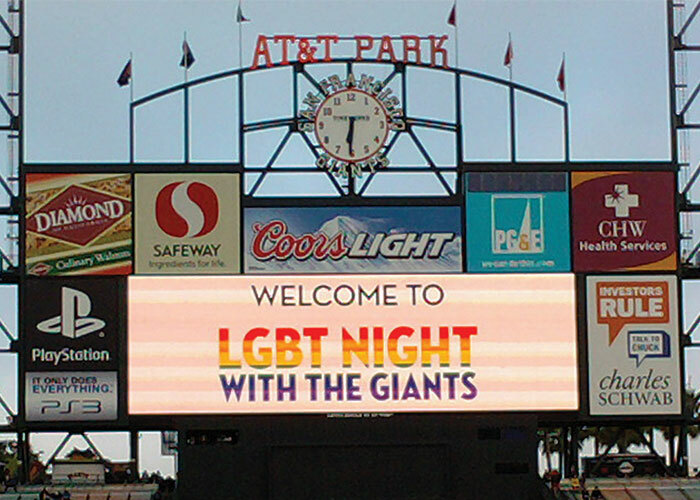 Professional baseball is really coming together to organize a succession of LGBTQ Pride Nights. These special game nights, like the National Hockey League’s (NHL) series of Pride nights that partner with the You Can Play Project, are specifically marketed to encourage a large turnout of the LGBTQ community to support their local professional baseball teams. Often the stadiums and fields feature rainbows, drag queens and perhaps even the local Gay Men’s Chorus there to sing the national anthem. And buying a ticket for this night means that a percentage of the cost is donated to a local LGBTQ charity. Every year more and more MLB teams and other professional sports teams and leagues are hosting LGBTQ Pride games in an effort to show that professional sports venues are a place where LGBTQ people, and athletes in particular are welcome. After years of being one of the last places where homophobia, transphobia, racism and sexism were considered appropriate, professional sports groups are finally trying to root out the prejudice that for generations has given them a black eye. This has not been an easy effort; just recall the 2016 Padres Pride night incident with the San Diego Gay Men’s Chorus. The chorus was on the field ready to sing the National Anthem when a recording of a woman singing was played instead. Chaos ensued and the chorus left the field to Padres fans taunting them with homophobic and sexist slurs. The incident actually came down to a simple human error with no malicious intent. But the taunting from the fans as the chorus left the field with their heads down shows that there is still quite an uphill battle to face when it comes to challenging the machismo culture that still exists in and around professional sports. In 2017 alone there are at least 11 MLB Pride Nights planned for the month of June. And each one has its own unique flavor, just as diverse as the LGBTQ community itself. Because of the good will shown by both sides following last year’s San Diego Padres and Gay Men’s Chorus fiasco, the Padres and San Diego Pride have built a working partnership. In a show of solidarity, this year’s event will include the San Diego Gay Men’s Chorus, San Diego Gay Women’s Chorus, San Diego Pride and the Padres together on the field, all singing the National Anthem. Changing the hearts and minds of the fans and players isn’t a quick, easy battle to win. As part of a long-term plan, MLB continues to build a relationship with the LGBTQ community. The league made a groundbreaking move in 2015 when it created the position of ambassador of inclusion and hired Billy Bean, a closeted MLB player who came out after he retired, to fill it. His mission is to help change baseball’s culture from the inside-out, not to convince closeted players to come out as some had expected. Bean’s quiet but effective behind-the-scenes work has earned him the new position of vice president of social responsibility and inclusion, and special assistant to MLB commissioner Rob Manfred. Yet in spite of all MLB’s internal and external efforts, like organizing Pride nights and creating a partnership with the National Gay and Lesbian Chamber of Commerce, there are no openly gay MLB players currently in the league. Being LGBTQ does not affect an athlete’s performance. All athletes on that field are there for the same reason – they are there to play the game and win using their full capabilities, both mentally and physically. In a team sport like baseball, the athletes depend on their teammates to work together to achieve the common goal of winning the game. Yet athletes who cannot feel comfortable being themselves, of having to play with a team that cannot accept them for who they are as individuals, wind up carrying a large weight on their shoulders. How can athletes expect to play at the highest level and to contribute their best to the team carrying that burden? These barriers still are quite prevalent within the culture of professional team sports. Despite all that professional sports leagues may do on the surface to show themselves as being LGBTQ-friendly, it will take an even bigger effort on the team level to create a safe, inclusive and welcoming environment, one in which an athlete can feel comfortable coming out. Pride nights are just the beginning of that movement. Equality has not come without sacrifice, a fact that has been shown many times throughout the LGBTQ rights movement, even before the Stonewall riots. There have been struggles, sacrifices, push back and even violence all in an attempt to reach equality. Billy Bean’s job is to change the MLB internal culture by challenging homophobic language, by speaking out against demeaning rookie hazing rituals and what he considers a huge personal responsibility – to provide “a constant, relatable image” of a gay man. He realizes that for some, this may the first conversation they’ve knowingly had with a gay person. But one person or team alone cannot show the world of professional baseball that an openly LGBTQ player not only belongs but also can be as competitive and capable a player as any other athlete out there. Attending an MLB Pride Night is not just about supporting baseball, it’s about celebrating our community while building opportunities to have a positive impact. We will challenge the status quo by doing what we’ve always done – reminding the world that we are here and we belong. Show your PRIDE and play ball! Part two of three of our Pride Month Sports Feature.